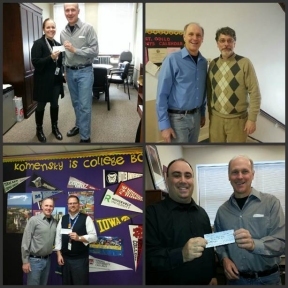 Robert Fejt, Berwyn’s 4th Ward Alderman, recently donated $2000 to local schools, which included $500 of his own money. During his election campaign in 2013, Fejt stated his commitment to make donations to local schools in his ward, including Hiawatha School, Saint Odilo, Komensky School and Freedom Middle School. “I made a campaign promise last year that I would donate personal funds to help schools in my area and I’m honored to present checks to local Berwyn schools to help support them,” Fejt said. Schools will use the funds to support after school programs and provide school supplies to needy children. Fejt said he would make the donation again in the coming year. Fejt was elected Alderman in spring of 2013 with a 65-35 margin. Fejt is a life long-year resident of Berwyn, currently serves as a firefighter and owns his own landscaping firm. He is married and has a daughter who attends Hiawatha School. For more information visit: www.bob4berwyn.com.